Some mornings River wants to do a project before I've cleared the cobwebs from my old brain. One of those mornings he requested a project as I poured his cereal. In an instant a project was born. I mix cereals together - the really yummy ones with the more "serious" ones (I know, I'm a mean Mommy). 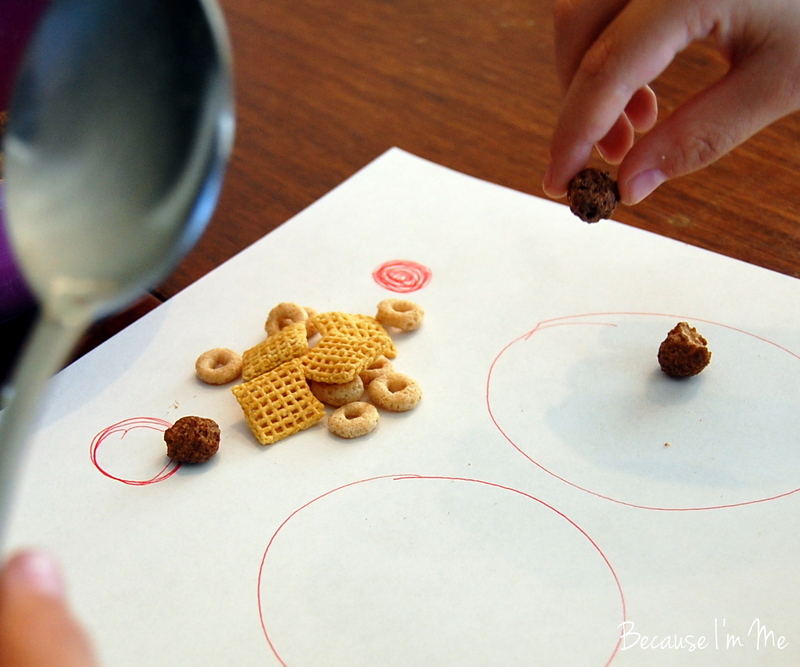 This particular morning we had Chex, chocolate cereal, and Cheerios mixed together. 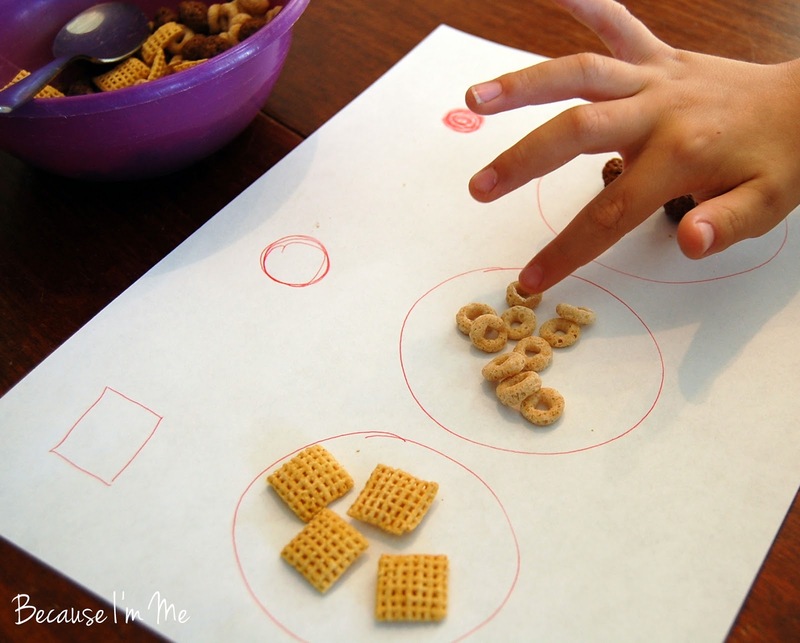 I took a plain piece of paper and drew three circles on it, labeling each circle with one of the cereal shapes. River started by pouring a spoonful of cereal on the paper and sorting it. After sorting he counted the amounts in each circle and ate them up. Next he worked to get as many pieces of cereal on the spoon as possible. 26 was his record. River skips the number 13 all the time, so lots of counting into the 20's helps to memorize those tough teens. 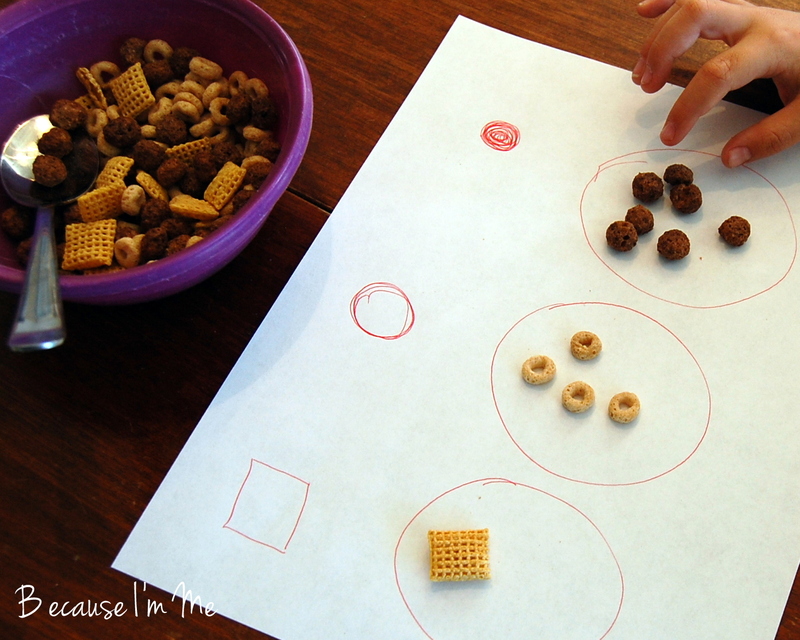 He then sorted a spoonful of cereal and did a little adding as he added more cereal to each sorted circle. And then he subtracted and ate. I'd give him a number of cereal pieces to add or eat and he'd count up or down as he played. This type of project is great for a number of reasons - he had fun eating his cereal and had no idea he was learning, out of pocket cost was $0, and it's something that can be done at a moment's notice. I'm sure there are more variations to the game and I'd love to hear yours.